Generations have sent wordless messages with flowers. Food ‘speaks’ as well. Rene Black, manager of the Waldorf-Astoria’s restaurants for many years, was once asked by a cadet at the Naval Academy to bring the hotel’s culinary arts to bear on an affair of the heart. He wanted to persuade a lady to marry him. For the evening of the proposal, Mr. Black suggested a menu that would include” a breast of chicken served in a little nest to represent the safety of the ketch” –a sailing vessel–and a dessert “bearing the nomenclature ‘Ritorna vincitor'”–Return a Conqueror! The description of the evening Mr. Black arranged for the couple and the story of how the midshipman’s suit fared appeared in Gourmet Magazine (December 1978) “An Evening At the Waldorf” by Jean and Bud Ince. It holds the record for receiving more responses from readers than any other article in the magazine’s history. 3 16-ounce sized cans of Artichoke Hearts: there are about 8 hearts in a can of this size. For this recipe, the hearts are cut in halves or about 6 pieces for each person in a dinner for 8 people. 1. 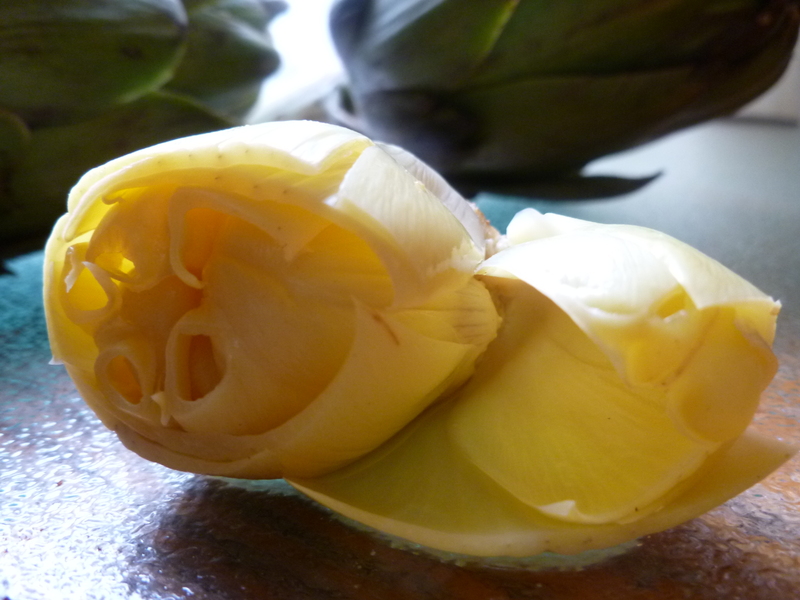 Cut the artichoke hearts in half, lengthwise. 2. Heat 1 Tablespoon of the butter and half the olive oil in the pan over medium heat. …and transfer them, a few at a time to the bowl of beaten egg. Coat the hearts in the egg and transfer them to the pan, cut side down. Add as many to the pan at one time as it is possible to sauté in one layer without crowding them together. 5. Transfer the golden hearts to a tray lined with paper towels. 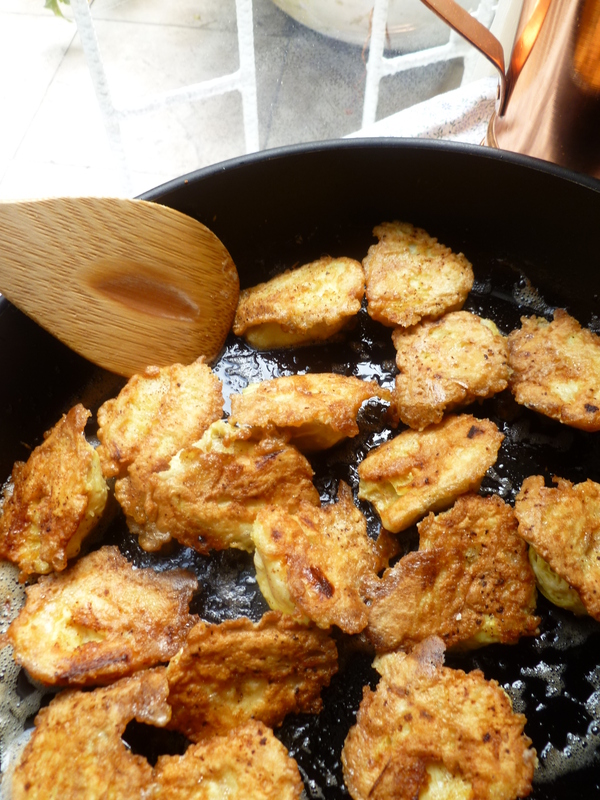 Wipe out the pan, add the second Tablespoon of butter and the second half of the olive oil. 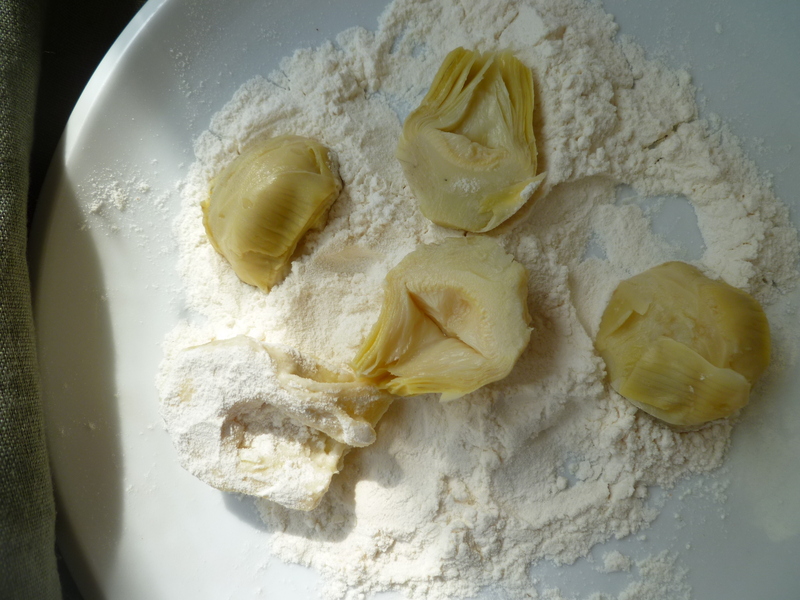 Roll the remaining hearts in flour, dip them in egg and sauté them. Transfer them to the baking sheet as well. 6. Wipe out the pan again. 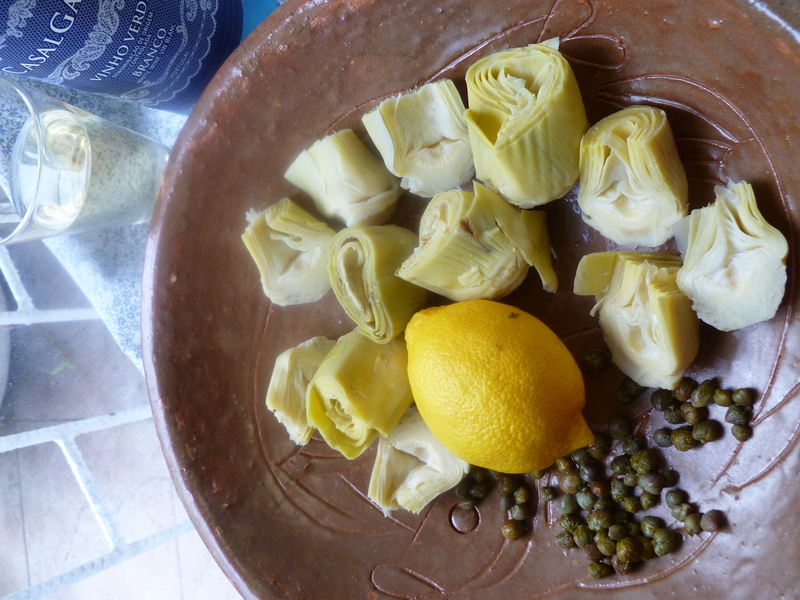 Return all the artichokes to the pan and heat them over medium heat. Add the wine and the lemon juice and cook the hearts until they have just absorbed both of them. 7. 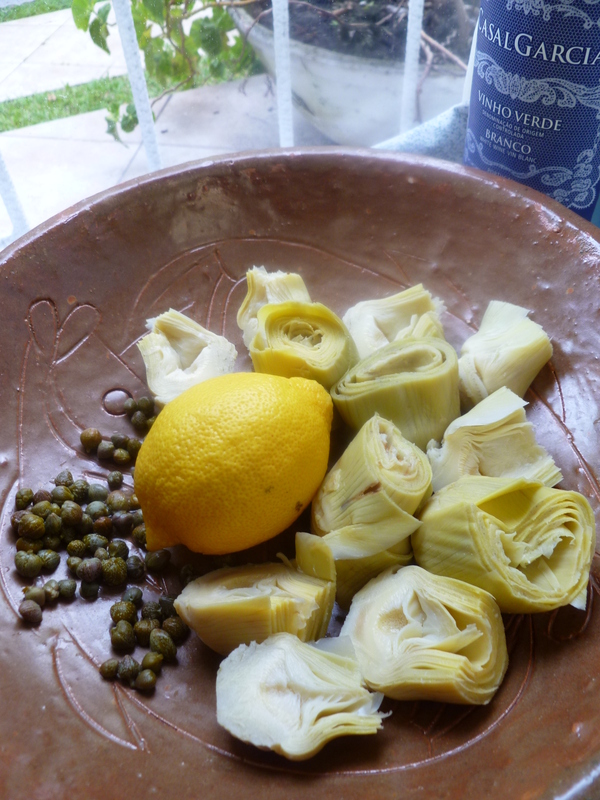 If you are serving the artichokes immediately, sprinkle on the capers and parsley. 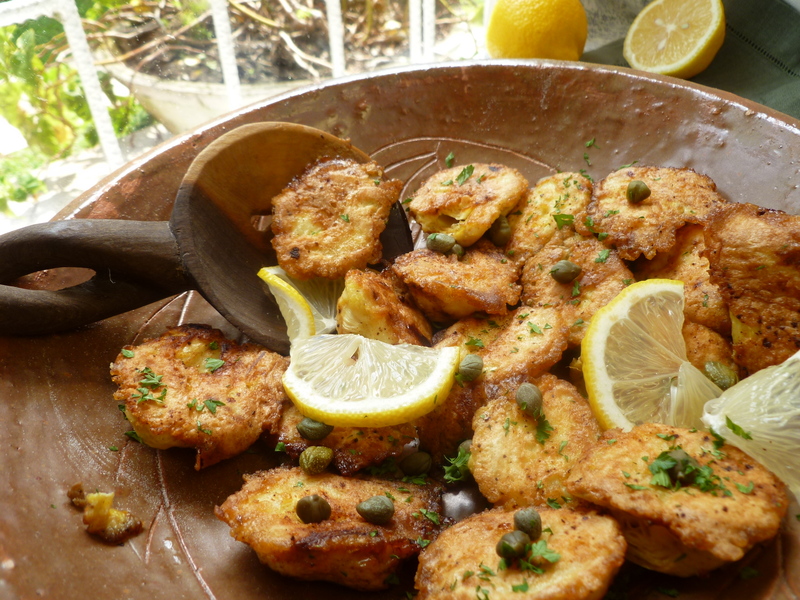 Otherwise, you may leave the artichokes in the pan, reheat them and add these last two ingredients just before putting the artichokes on plates–or, as an appetizer, in a bowl. 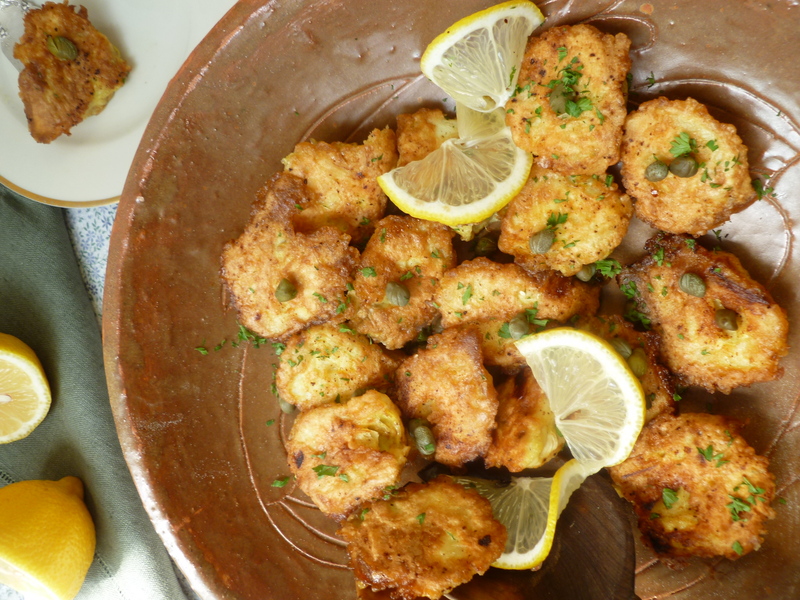 To serve as an appetizer, place a spoon in the bowl for guests to use to serve themselves a few, with capers, onto small plates. People will need forks to eat the hearts as an hors d’oeuvre. Lemon twists look nice, added to a bowl of the hearts. They’re made in the same way as the Orange Twists in this previous diplomatickitchen recipe. 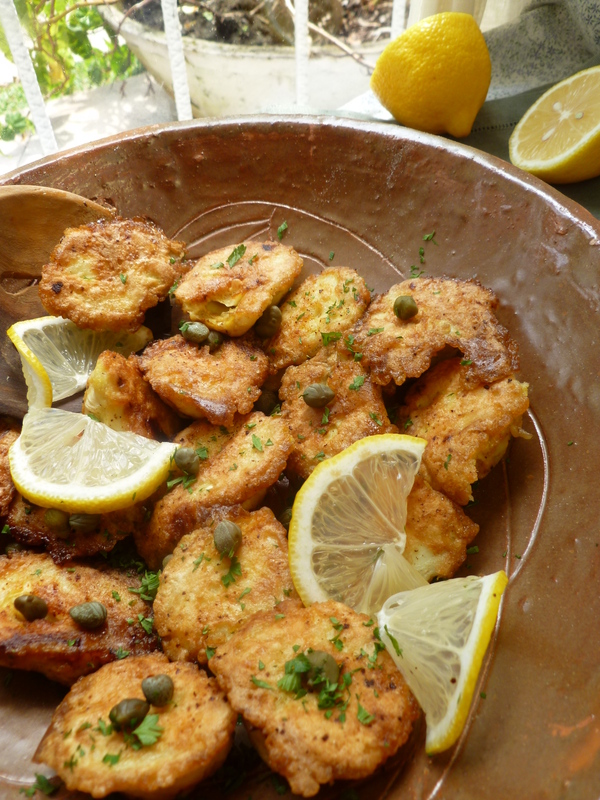 A Note: Sauté of Artichoke Hearts with White Wine, Lemon and Capers is served alongside the Main Course in the Dinner Menu: Dinner in Early Spring. These are crazy good and can be refrigerated and reheated. These are what you get in the best of restaurants and think you could never make at home = soo easy! Ppl went nuts! Glad you liked them! And useful to learn that they refrigerate and reheat well. These are amazing, have made twice now and getting ready for a third. I prepare as wonderfully written and serve over cooked angel hair or spaghetti, with a little lemon infused olive oil mixed in…topped with grated Parmesan. Thanks for this great recipe! I will try your idea of making it into a pasta dish. It sounds very good.